Personalized sunscreen and lotions not only identify your company and create long-term brand recognition, they're a compact item your customers and clients hold onto and pull out whenever needed. Our printed promotional sunscreen with carabiner, sunscreen with aloe lip balm, after sun gel, and more are great items to give away at industry trade shows and to pass out at job fairs to keep your brand in the forefront of potential employees' minds. Our all in one water bottle with sunscreen, aloe and lip balm included is an incredible package that customers and potential customers will appreciate. Always remain protected from the sun’s harsh rays with the 1 oz. SPF 30 Sunscreen Bottle. 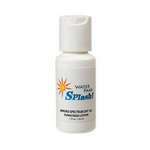 Provide portable sun protection to clients with our 2 oz. 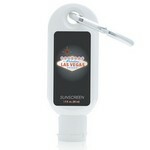 white round sunscreen bottle. A customized 8 oz. 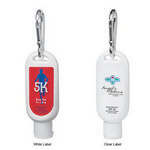 white round pump sunscreen is a convenient promotional item for the next company beach day or summer picnic event.